The Kewpies originally appeared as a comic strip in the Christmas issue of the 1909 Ladies Home Journal. Roly-poly cherubs with large heads, rosy cheeks, big eyes, and mischievous grins, the illustrations were the creation of Rose O’Neill, a commercial and fine artist, novelist, and poet. O’Neill eventually turned these impish cartoon characters into a marketing phenomenon. Pre-dating the introduction of Mickey Mouse, the Kewpies promoted everything from Jell-O to Cologate and adorned licensed merchandise from salt and pepper shakers to baby rattles, making Rose O’Neill the highest-paid female illustrator in the United States. At age 19, with her first novel, Calesta, complete, O’Neill moved to New York in hopes of finding a publisher for her book but instead found work as an illustrator for a number of New York magazines. By 1897 she was the only woman on staff at Puck and her illustrations regularly appeared in Woman’s Home Companion, Good Housekeeping, and Cosmopolitan. The popularity of the Kewpie image encouraged O’Neill to design Kewpie Kutouts in 1912. 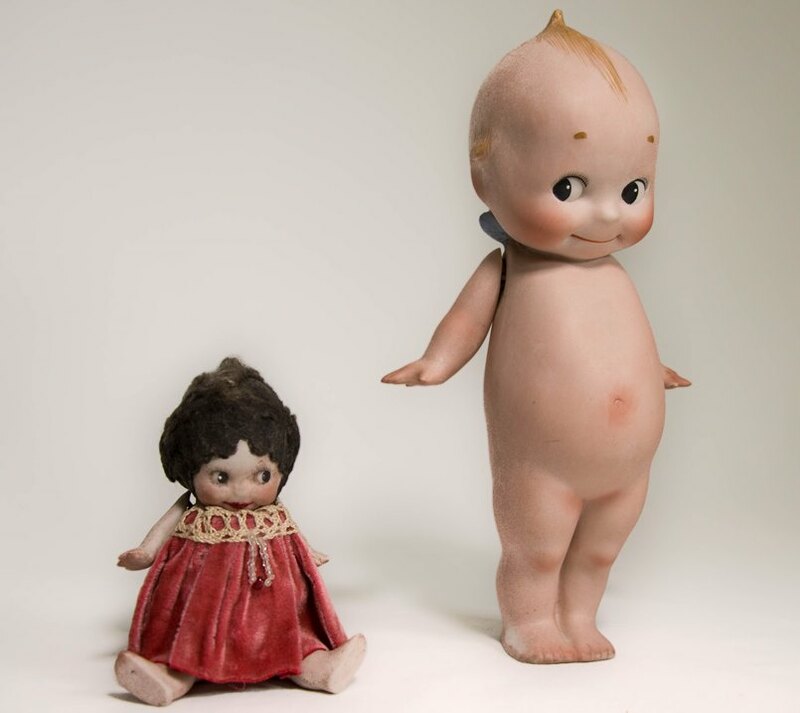 Always an innovator, O’Neill was the first to depict paper dolls with both a front and back view and the increasing popularity of the Kutout dolls led to the production of Kewpies as real three-dimensional dolls that same year. In 1913 the dolls were patented and the KEWPIE trademark registered. The first dolls were made out of bisque porcelain and sold in nine different sizes. With the outbreak of World War I, production moved from Germany to the United States, where demand soon had twenty-one factories producing the dolls out of celluloid, wood pulp, and, eventually, fabric. The impish Kewpie with the blonde curly-cue spring of hair on top and the big belly had lost their wings but they were flying off the shelves and providing O’Neill with millions of dollars in royalties. The Kewpies were officially a worldwide phenomena. Rose O’Neill, having become financially independent, owned homes in New York, Westport, and Capri. She purchased her eleven-room Westport mansion (Castle Caraba) in 1922, where she welcomed artists, writers, cartoonists, and musicians, including such notables as Martha Graham and Charlotte Perkins Gilman. 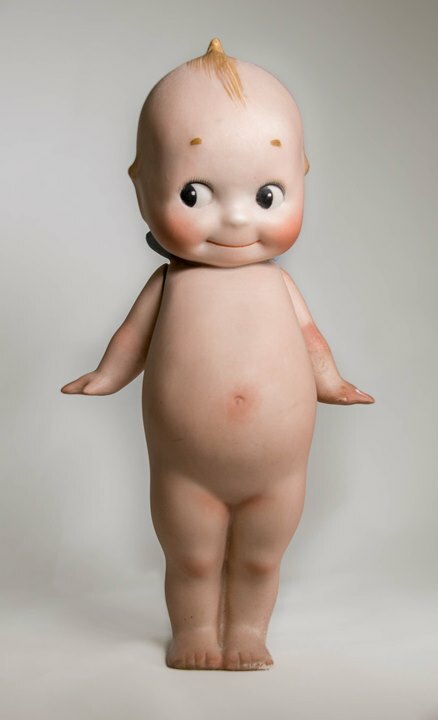 While an array of O’Neill’s art was eventually exhibited at galleries in Paris and New York to much acclaim, it remains the Kewpie doll for which O’Neill is best remembered. “Rose O’Neill.” Bonniebrook Gallery, Museum, and Homestead, 2016. Link. 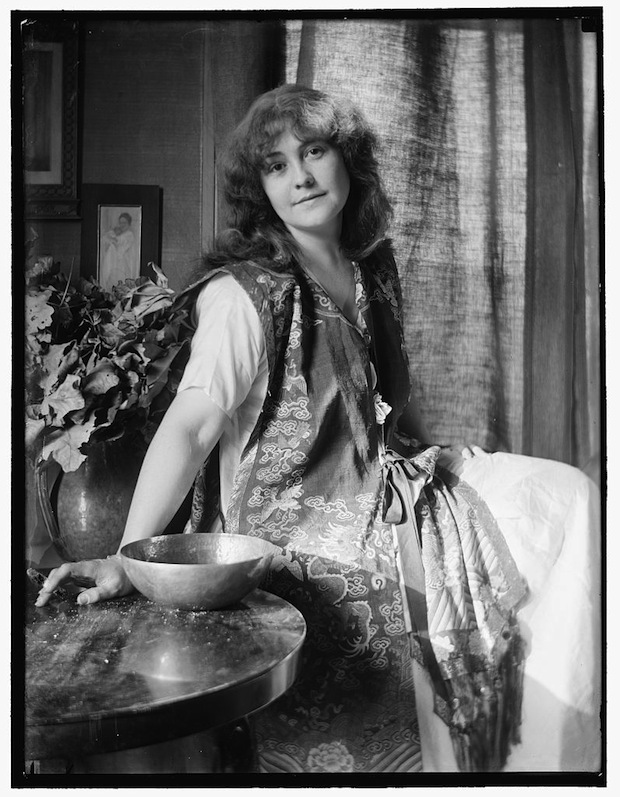 “Digital Collection: Works by Rose Cecil O’Neill.” Library of Congress, Prints and Photographs Collection, 2016. Link. Quinn, Elisabeth V. The Kewpie Primer. New York, NY: Frederick A. Stokes, 1916. Link. O’Neill, Rose. The Master-Mistress. New York, NY: Alfred A. Knopf, 1922. Link. O’Neill, Rose. The Story of Rose O’Neill: An Autobiography. Columbia, MO: University of Missouri Press, 1997.